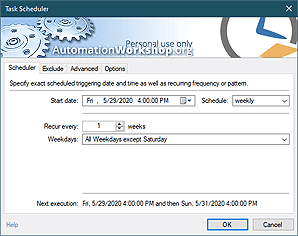 Automation Workshop is a free Windows automation application. Ready-made modules, such as Triggers and Actions, can be interconnected in multiple ways to build Tasks that automate workflows of various complexity. Triggers monitor the system and tell when or on what conditions to start the Task, and Actions within the Task perform specific operations to respond to these conditions in fully automated manner. By eliminating the mundane and repetitive work, the sizeable amount of time is freed to focus on more important work! If this sounds too abstract or theoretical, please look at the triggers and actions below. Once you see the wide range of triggers that Automation Workshop Free Edition can monitor, and the wide range of actions that the software can take, you'll think of dozens or opportunities to save wasted time by automating your repetitive tasks. A growing list of Triggers for automatic Task execution when specified criteria match the system state. A Task can be executed upon change in file system, on schedule, when a user logs in or out the system, upon system startup or shutdown as well as other events. File / Folder Watcher · monitors specified path for various changes in file or folder contents, such as creation of new files or folders, as well as modification, renaming or erasing of existing ones. Task Scheduler · allows planned Task executions based on basic to complex schedules. User Logon / Logoff · monitors system logins and logons to start the Task when necessary. System Startup / Shutdown · automatically executes upon system startup or shutdown. Manual run · runs a Task at user's request, thus providing batch file replacement options. Comprehensive list of Actions includes file and folder operations, email sending capacities, registry tools, file compression and extraction features, command prompt functionality, user interaction options, external application execution, return code processing as well as automatic Task management and other features. Run · execute external programs, applications, batch files, commands and scripts. Email · take care of email sending automation in comprehensive way. File / Folder · copy, move, rename, delete, list, read and write files and folders. Folder · create, duplicate, move, rename, delete or clear folders. Compression · compress and extract archive files. Dialog Boxes · add user interaction layer to automated Tasks. Multimedia · play audible alarms, audio files and system sounds. Wait · pause a Task to allow some process to finish or user to interact. Printing · print files from their associated application on default printer. Registry · perform a range of registry manipulations including export and import. Compare · evaluate criteria to conditionally execute one set of Actions or another. Loop · create conditional and unconditional loops that repeat set of Actions in every cycle. Flow · create the labels and use redirection Actions to manage the workflow. Text · find, replace, extract, split, merge, trim, pad, recapitalize and convert text strings. Variable · create custom variables to extend data exchange among Actions. Comments · use comments to leave notes directly in Task sequence. Tasks · enable, disable or toggle a Task or group of Tasks. Log · additional options for logging automated Task performance. Automation Workshop Manager is an easy to use graphical interface that allows creation, modification and deletion of the Tasks, overseeing automatic Tasks as well as configuring settings, viewing log files and much more. Operations Manager shows a summary overview of essential Automation Workshop features such as memory use, active triggers, service uptime and Task related data. Queue Manager provides real-time Task management: it is possible to change the order of queued Tasks, set the number of concurrent Tasks, view recently completed Tasks and more. Log Manager delivers powerful logging capabilities. In addition to the log pane in the Automation Workshop manager interface, there are also options for logging data from any particular Task or from a group of Tasks, as well as from the common log. From the most general data to the most detailed information about fine-tuning and debugging your triggers and activities, the logs deliver the information that you need. Task Finder makes it easy to locate a particular Task by its name, active Triggers, contained Actions, user credentials or other parameters. While it will help to quickly find a Task in any scenario, it is especially useful when deploying a multitude of automated tasks. Event Details shows detailed performance information categorized by its type, namely, Errors, Warnings and Information messages. Variable Wizard allows for close integration of various Automation Workshop components by allowing Triggers and Actions to exchange important operational data among them when necessary. Instead of telling Action what to do in advance, just let it ask the preceding Trigger or another Action for what exactly needs to be done. Task Wizard allows you to create automated Tasks that will take care of daily repetitive work. Follow step-by-step instructions to configure and deploy automated solutions that are based on modular design. I love the Automation Workshop. Simple, clean and very functional. —Sean W.